Lucknow, July 27: Former Bihar chief minister and RJD president Lalu Prasad Yadav has endorsed Congress vice president Rahul Gandhi as the next prime minister. Lalu Yadav said in Mirzapur Friday that Gandhi was "fit to be the prime minister and had all qualities of a bright leader". "Rahul Gandhi has nothing negative about him. If given a chance by the people of India, he would prove to be a good prime minister," he said. Lalu Yadav added that he would do everything to stop Gujarat Chief Minister Narendra Modi from becoming prime minister. "I will do everything I can to stop Modi from becoming prime minister," he said. Hitting out at the BJP, the Rashtriya Janata Dal chief said his tough stance against L.K. Advani during the Ram Janmbhoomi movement in the early 1990s ensured that the BJP leader never became prime minister. 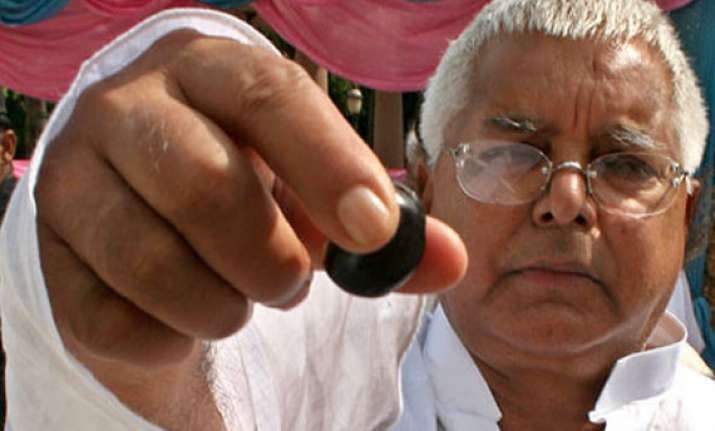 Lalu Yadav said that he supported the Congress for its secularism but he was displeased with the recent comments of Congress leaders on poverty. He said many people in India could not afford two meals in a day. He blamed Bihar Chief Minister Nitish Kumar for "playing with the lives of school students" and held him responsible for the deaths of 23 children after they ate a mid-day meal in a government school. "Whatever bad happens in Bihar is heaped on the opposition parties. This is very unfortunate," he said.